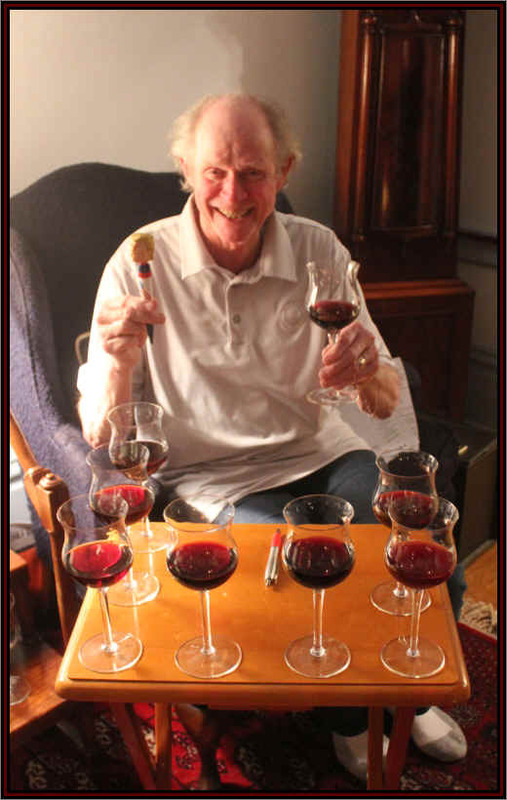 Vino Fino Member John McGlothlin was interested to survey some domestic reds made with Rh�ne grape varieties, so he came up with a few bottles of varietal wines and we sourced a number of blended bottlings. There are many good, well-priced Rh�ne wines. You can buy some pretty nice wines costing $10-$20 from France's Rh�ne Valley. 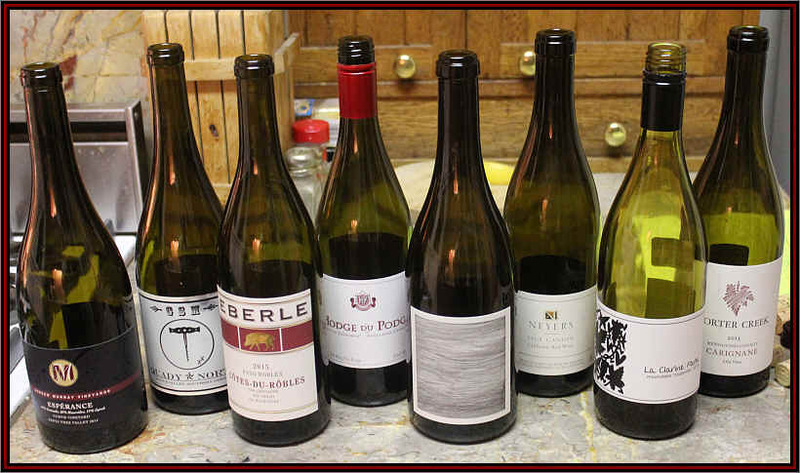 But the cost of making wines in California is a bit different and so many of the Rh�ne-Wannabees is a bit higher. 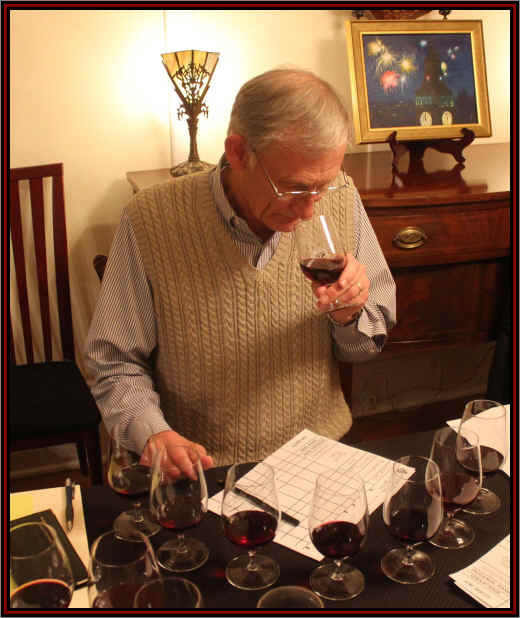 Three of the 8 wines are mono-varietal bottlings (but not Syrah and Grenache), while the other wines are blends). 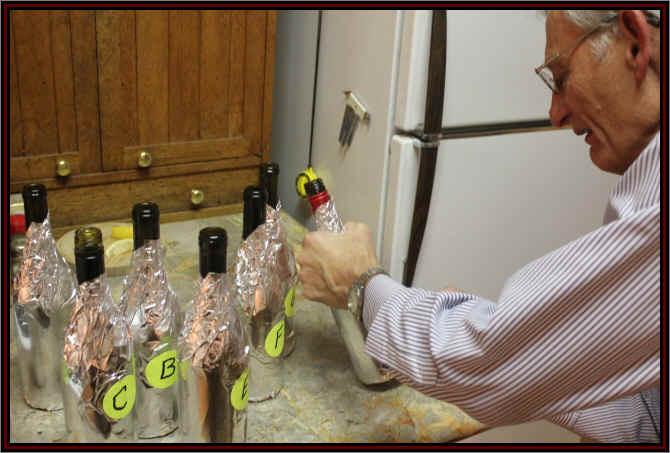 One of the wines comes from Southern Oregon's Rogue Valley, while the rest come from various sites in California. 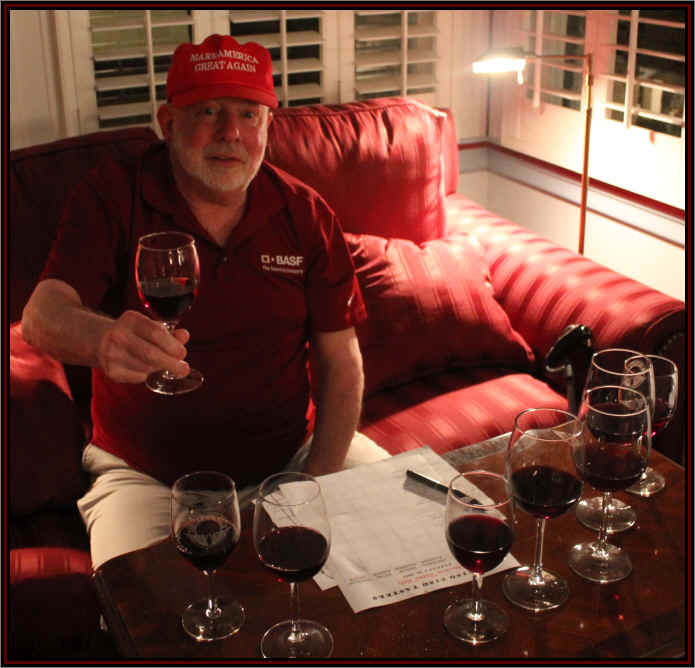 Overall, the wines were well-made and of good quality. One wine, the Andrew Murray, finished well ahead of the group in First Place. 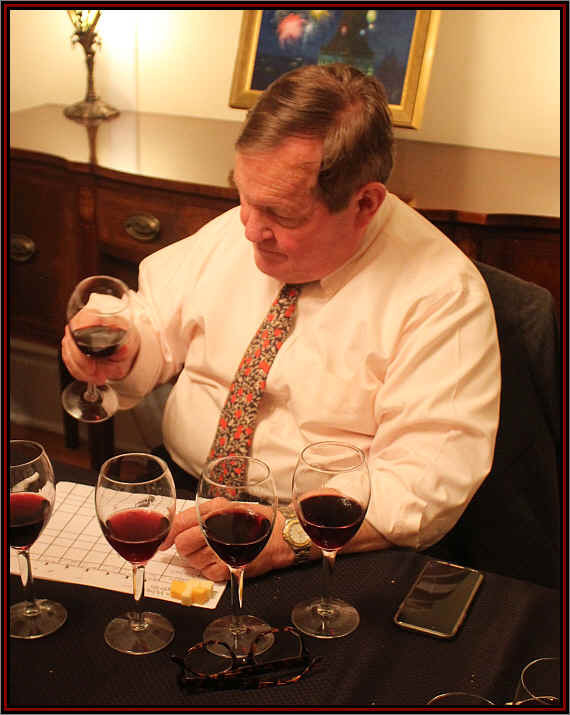 I didn't find any truly remarkable wines in the tasting...they were standard to pretty good. My top wine was rather disliked by the group, though one taster also had it in first place. I will admit it's a bit particular and this was off-putting for some tasters. Medium ruby in color and clear in appearance, this wine showed a nice fragrance from the start. Lots of dark berry fruit made for an interesting nose. The wine was dry and showed good acidity. Medium+ in body. It's a fairly tannic red and full on the palate with berryish notes and a mildly earthy tone. I like the nose better than the flavors, but perhaps time will enhance this. I gave this one star on my three star scale, with no stars being an ordinary or standard quality wine. 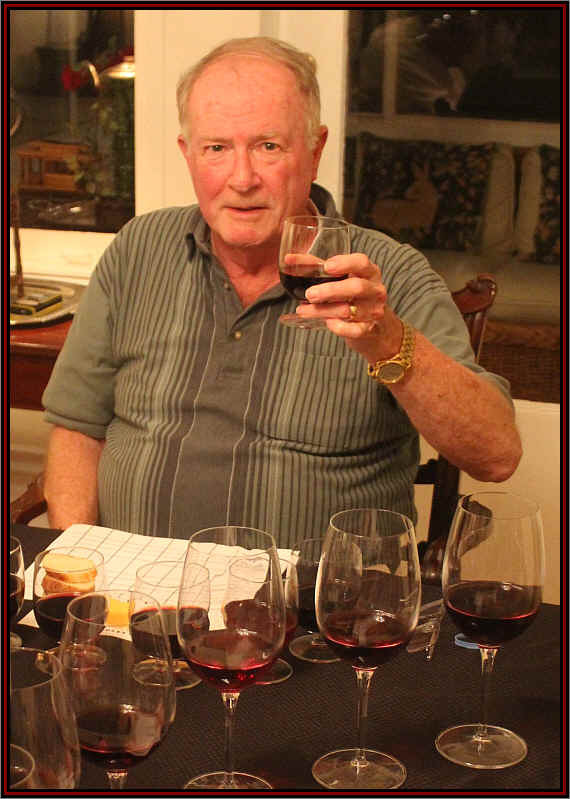 7th Place: LA CLARINE 2015 Sierra Foothills MOURV�DRE "Cedarville Vineyard"
Clear in appearance and medium light garnet in color, this wine had an intriguing fragrance. Some tasters found it disagreeable, though. I found red fruit aromas and a note reminiscent of orange peels. There's a touch of a spice note, as well, with a whiff of pepper. But some tasters found it strange and off-putting. The wine is dry and has good acidity. Medium bodied. On the palate this is a bit of a fruit-bowl, with lots of red fruits, a touch of spice and that orange peel element. It is immediately charming (unless you find it repugnant) and probably best consumed in its youth. One and a half stars. Medium ruby in color and clear in appearance, there's a lightly berryish, red fruit character to this wine. It struck me as playing solely this one note, but the raspberry quality is certainly pleasant. Dry and nicely acidic, it's a medium-bodied red. There's a touch of tannin on the palate and it's a bit mouth-drying. I liked the red fruit notes, though and gave this my third place ranking. 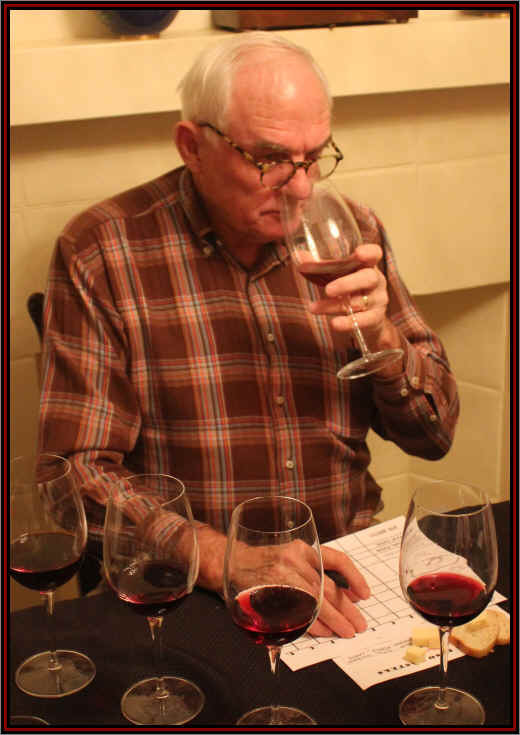 5th Place: BROC CELLARS 2014 Mendocino COUNOISE "Eagle Point Ranch"
Light garnet in color and clear in appearance, this didn't have much character on the nose or palate. There's a faint red fruit fragrance. Dry and nicely acidic, it's a lighter-bodied red wine. I described it as simple, vinous and a standard red wine with a bit of tannin. But it didn't strike me as having much personality and no complexity. Standard. Ho hum. No stars. Yes, what a name...Hodge du Podge. Very clever and cute. It's a kitchen sink blend of grapes. Medium ruby in color and clear in appearance. The nose showed a lightly smoky element and some jammy notes. I thought it might have a touch of sweetness and marked it down for that. The acidity is low, on top of that, making for a rather flat impression on the palate. The flavors are of candied fruit and jam...dull overall. I ranked it last, yet the group found a measure of charm here. No stars from me. Medium- ruby in color and clear in appearance, there are berry and earthy notes on the nose with a faintly woodsy quality to its fragrance. Apart from its name tipping its cap to Grenache-based wines from France, this seemed to be a nicely Rh�ne-ish red. It's dry and shows good acidity on the palate, with medium+ body. There's a touch of tannin here, but balanced by a mildly creamy flavor and some woodsy notes. The berry/earth and wood spice come through on the palate and I found this to be quite good. A One+ star rating would be about right, but it's close to One-and-a-half stars...Good job! Deep ruby in color and clear in appearance, there's a faintly earthy fragrance at the outset and I kept finding an odd note reminiscent (to me anyway) of band-aids or plastic. The wine is dry and has nice acidity. Medium+ body. That earthy quality is accompanied by a burnt rubber sort of quality on the palate and it just did not appeal to me. But a couple of tasters were enchanted by this. I'd give it maybe a half-a-star rating at best. Medium ruby in color and clear in appearance, this wine also displayed good C�tes-du-Rh�ne sort of character with berry and spice notes. There's also a touch of a cocoa-like fragrance. Good acidity and it's dry. Medium+ bodied. Berries and mild tannins on the palate with a nicely spicy quality to its finish. One to one-and-a-half stars. It was well-liked by the group and easily finished in first place.